Check with your local PBS station for possible additional broadcasts. For information on videotape and DVD availability, click here. 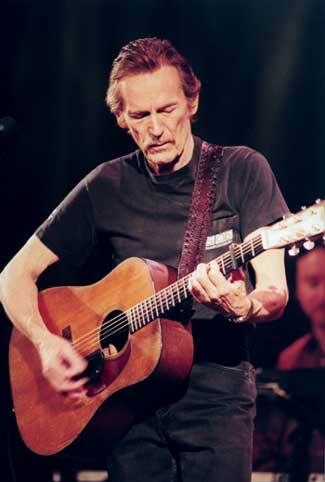 For the first time since 1979, Gordon Lightfoot appeared on U.S. TV in a live concert appearance taped in Reno, NV on April 19, 2000. PBS broadcasts began in early December. The broadcast showed Lightfoot and his band performing 14 songs from that concert, including almost the entire second set of the evening. PBS stations offered a videotape of the concert as a pledge gift. The broadcast included all of his biggest hits: If You Could Read My Mind, Sundown, Carefree Highway and Wreck Of The Edmund Fitzgerald, as well as other signature songs like Don Quixote, Early Mornin' Rain, Song For A Winter's Night, and Canadian Railroad Trilogy. Many stations used the show as part of their December pledge drives. Other stations showed it as a special, not a pledge event, and still others may use it for a later pledge period. On October 15, 2000 CBC-TV in Canada broadcast a one hour program of 11 songs including two which will were not included in the US broadcast, and one - Beautiful - that was not included in the subsequent DVD release (but you can find it on You Tube).. The 14 songs in the PBS broadcast are: Act One - Carefree Highway, Sundown, Don Quixote, I'll Prove My Love and Wreck of the Edmund Fitzgerald; Act Two - Rainy Day People, Baby Step Back, Fading Away, Shadows and If You Could Read My Mind; Act Three - Early Morning Rain, Make Way for the Lady, Song for a Winter's Night and Canadian Railroad Trilogy. The full concert set list is as follows (thanks to Jenney Rivard). Asterisked songs will be on the PBS broadcasts; songs with ! were shown on the CBC special (thanks to Charlene Westbrook for the CBC set list) and those with V are on the 22 song VHS videotapes and on the DVDs.